Fernando Alonso girlfriend is Lara Alvarez, a Spanish sports journalist and TV host. She was born in Gijon in 1986, a small city very close to Fernando’s. Lara Alvarez began her career in his province but soon jumped to Spanish national TV as a co-host of some sports programs and the MotoGP live broadcast. In the last 2 years Lara has been in all kind of programs, as she began to be more known between the Spanish audience due to her relationship with Real Madrid’s player Sergio Ramos. They began the relationship with Fernando Alonso last December, when the Spanish magazine Hola featured them on cover with some pictures in New York. Later she was seen with Fernando in the Ferrari Christmas Party in Maranello. Lara Alvarez has been in 2015 hosting the Spanish TV reality program “Supervivientes”, where she had to stay in Honduras during 4 months, although Fernando Alonso went to visit her a couple of times. Fernando Alonso is a Spanish motorsport driver racing in F1. He was born in Oviedo, Spain in 1.981. His began his career in motorsport at the age of 3, when he first drove a go-kart that his father built for her older sister, but she was not interested. His careen in F1 began in 2001 when Ferrari was first interested in Fernando, who the former season drove in the Euro Nissan Series, but finally he signed with Flavio Briatore and he began driving for the Minardi team. Next year he came back with Briatore in the Benetton-Renault team, but as a test driver. The following season he became official pilot of the team when Jenson Button who signed for BAR. In his first race in Australia, he was 7th getting his first points in F1. It was in Hungary the same year when he won his first Grand Prix. He was F1 world champion in 2005 and 2006 with Benetton- Renault, being the youngest to get a F1 World Champion title at the age of 24. Next year he signed for McLaren-Mercedes, where he was team mate with the rookie Lewis Hamilton. Some arguments with Hamilton and the team lead Alonso to leave McLaren and come back to Renault in 2009 and 2010. From 2010 to 2014 was the Ferrari era, in which Alonso got the 2nd position in the Drivers championship in 2010, 2012 and 2013. It was also the Red Bull era, so Alonso could not get any title. From 2015 , Fernando Alonso is in the McLaren Honda Team together with Jenson Button. 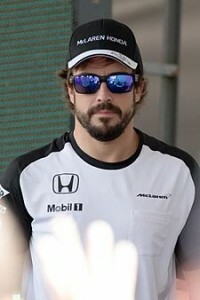 Fernando began a relationship with Spanish journalist and TV presenter Lara Alvarez in 2014, and some people close to them say that they are engaged.